I have been back in England staying with my parents for the last two weeks, and I have had a couple of slightly easier training weeks before I head off to South Africa for January. I have taken the opportunity to do quite a bit of work, making maps of two large schools, a park and updating and extending a forest in Kent. I have also done a few races. On 23rd December I did the Army Long-O/Bike-O around Longmoor, Woolmer and Borden. The last two years I have just done the running, but this time I decided I wanted to have a go on the bike, so I decided to do the medium bike (17km), and then run the brown course (9km). I have only ever done MTBO once before, and that wasn't a proper event, so it was a bit of a steep learning curve. I borrowed a bike, and unfortunately the map board wasn't screwed on properly, so it wobbled and spun around, and eventually fell off which was a bit unfortunate. I also got blisters on the palms of both hands which was a bit annoying. Technically, it was very good except for one control - they had joined up existing orienteering maps with sections of OS map, which are much less detailed, and not very easy to read. On control 5 I went sailing past the junction and made a 4-5 minute mistake. Hmmm. Was good after that really. Will have to do some more MTBO sometime. Five minutes after finishing, I did the brown course. I felt really good off the bike and made a really fast start (although I ran into a nasty looking fence on the way to number 2 and had to go back round). Caught up Nick Barrable about number 6, and had a good little tussle with him for some of the course. He was running slightly quicker (having not done the biking), but I was a bit cleaner into the controls. On the 21st control, I decided that I wanted to run on my own, so I took a far left route (not ideal), and he got a bit ahead and we ran seperately from there. He pulled away a bit in the end, and I took the victory by 5 seconds! Every year Southdowns have a Christmas Score event, and I seem to run it every year. The forests down there are really nice and runnable, and although I am not a big fan of score events, this one is pretty good fun. I managed to get all the controls with about 5 mins to spare. Results here. Yesterday I ran a regional event on Ash Ranges, which is basically home terrain for me, about 5 miles from home. I have run there quite a lot, but it is always nice to do a race there. It is mostly open, with lots of heather of various depths, so it can be quite rugged, but still very fast. The course was really really good, with a variety of leg lengths and some really technical parts. It would be easy to have some dead legs, but the planner did a good job and it was all technically interesting. We started with a control pick, and I missed 10 seconds on the 2nd, and 30 secs on the 3rd (didn't see the pit as I ran past, but saw another control). After that I had a good period through the open area. 12-13 I stopped for a moment to check another competitor was ok, and lost my direction slightly. Coming out of 13 I completely misread the wall as crossable, so I ended up taking a long way around to 14. 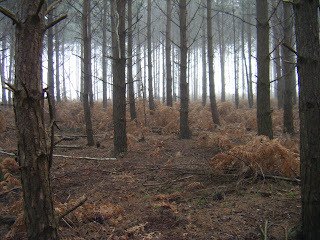 Then another tricky part through the woods before a few longer legs through the open. The heather was up to waist deep in some parts here, but I felt really strong. I navigated from 21 back to 12 (muppet), but it turned out not to be too bad anyway. 23 was slightly tricky, I came off line a bit and was hesitant. After that was really good though. Results here. Splits here. Tomorrow morning I fly to Johannesburg, and I will be spending the next 4 weeks in Dullstroom, about 2 hours east of Joburg. The altitude there is around 2000m. I will mostly just be training, but I am also going to spend a few days making a map for an o club down there.